The camshaft in a car's engine turns in time with the crankshaft and in turn actuates the valves in time with the movement of the pistons. The camshaft is connected to the crankshaft in various cars with different methods. I think most modern cars have a flexible toothed belt that connects the camshaft and and the crankshaft. In more traditional 1970's Detroit cars, the timing linkage was a heavy, flexible metal chain. The advantage of the flexible coupling is that you don't have a tight tolerance on the spacing of the crank shaft and camshaft, the belt/chain takes up the slack. The disadvantage is, of course, that they need to be replaced from time to time as part of the maintainence of the car. The air-cooled volkswagen engine was designed with a different coupling mechanism. 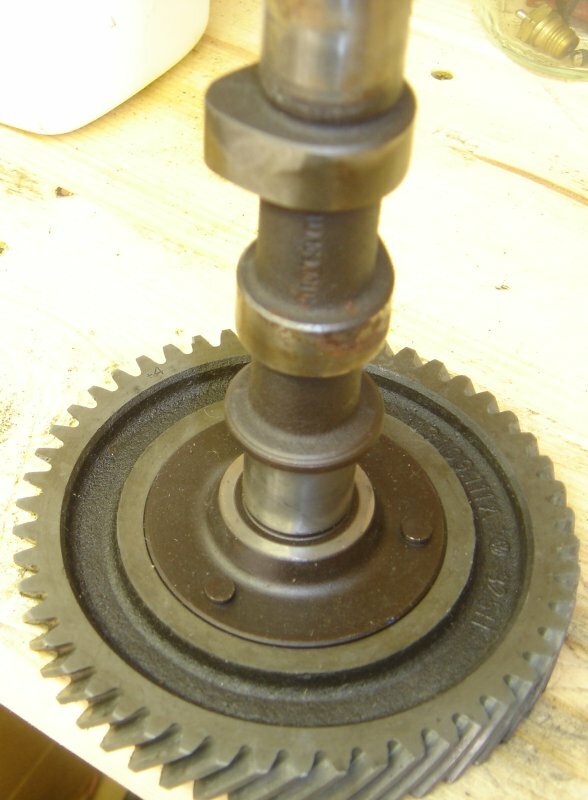 The camshaft is driven directly off of the crank gear-to-gear. Since both the camshaft and crankshaft run directly in the engine case, there's no flexibility between then, so there must be one way to take up the minor inconsitencies in the alignment of the shafts. There are slightly different sizes of camshaft gears. For specifics, and how to deal with it, see Bob Hoover's blog post "Dialing in your cam". I have no knowledge of this, I'm just putting up some explanatory photos. 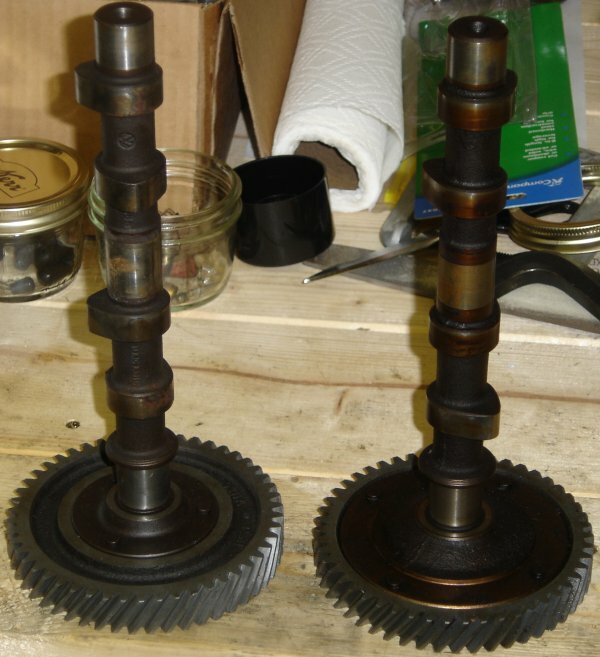 Here are two camshafts and gears. The one on the left is a three-rivet flat cam from engines 1969 and before. The one on the right is a four-rivet, dished camshaft used in 1970 engines and later. Here are the ends of the same shafts. Here you can see that the gear on the right is "dished" and the one on the right is flat. 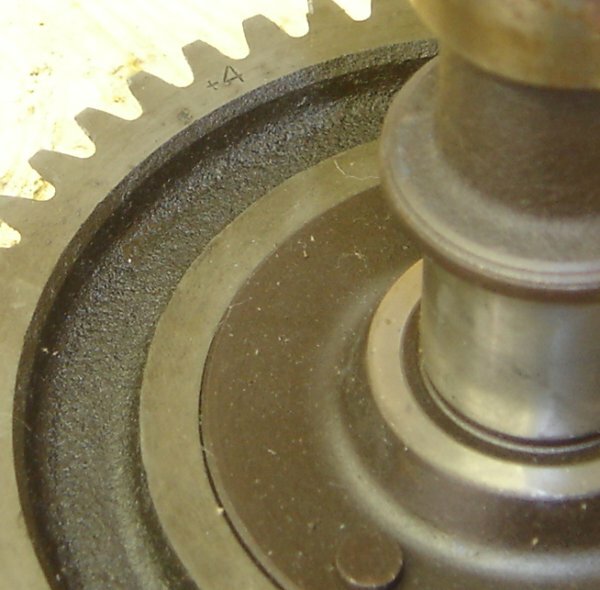 The later gears are dished to give more room for the larger oil pumps for the later engines. The point of this page is to show how to find the cam gear size marking. So here's a picture of the flat cam shaft sitting on the gear. 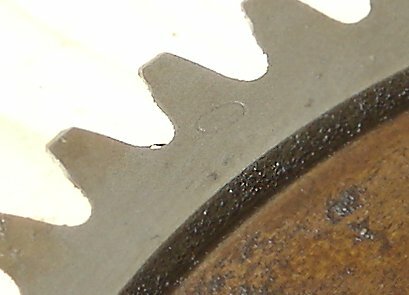 You can seen the "+4" size marking on the upper left part of the gear near the teeth.